ROYAL HUNT recently released their new - 11th - studio album: "Show Me How To Live". The band once more joined forces with former lead singer DC COOPER to continue the magic of Royal Hunt. To those who are discovering and re-discovering the band, here are the members: ANDRE ANDERSEN - was born on December 16th in Moscow, Russia. He studied piano since he was 5. He is a mix of Danish and Georgian "royal" blood and is a musical genius who can virtually play any instrument, compose, write lyrics and produce all at the same time. At the age of 13 Andre discovered a different genre of music aside from classical, by accidentally getting his hands on a copy of Deep Purple's ?In Rock?. From that point on, he started to combine his classical chops with the rock form in every piece of music he wrote. Andre speaks of Mozart and Paganini's work as his biggest inspiration next to people like Rick Wakeman and Jon Lord, who invented the "rock approach" to the keyboards. His musical influences are mainly the classics and the rock/hard rock scene that he studied and grew up with. Lyrics come easy to a guy who can read 2 to 3 books a week. In 1984 he moved to Denmark. After awhile he built his own working place - Mirand Studio (now expanded and removed to a recently established NorthPoint Productions). Having an opportunity to record all of his ideas without watching the clock, he started to create a whole set of compositions and songs where the elements of classical music, progressive and straight hard rock were mixed to create a unique signature sound. Andre reinforced and polished his "invention" by working with countless projects until the day Royal Hunt was formed and the final pieces - the music and musicianship of every individual - would fall into place. All of this makes Andre a powerhouse force that drives the entire ensemble forward like a bulldozer. DC COOPER - a native of Pennsylvania, born in the Appalachian Mountains, DC did not know that someday he would find himself traveling the world and performing top quality, vocal oriented music. DC's formative years in the music business saw him playing with several local area bands in his current hometown of Pittsburgh, PA. It was during this period that DC would begin to extend his reach by studying with renowned opera teacher Charlotte Coleman. This formal training helped to give DC the discipline that he needed to expand his control and overall vocal ability. DC paid his dues for several subsequent years on the local club circuit which, though gratifying to a point, would ultimately prove itself to scratch just the tip of his desire. For DC, the 1990s brought new goals and new ambitions. He found himself as a finalist in the auditions for a job left vacant by Rob Halford in the legendary British heavy metal band, Judas Priest. During these auditions word of DC?s vocal prowess began to circulate throughout the industry and particularly within the Hard Rock community. As a result of this buzz, DC was contacted to handle the vocal chores for numerous bands from Europe and the US. After carefully weighing all of his options DC would decide on Danish rockers, Royal Hunt. On December 26th, the day after Christmas, DC left for Denmark to meet the band for the first time and to begin rehearsals for the Japanese tour which was to begin on January 20th, a mere 3 weeks away. There were only to be 12 formal rehearsals for DC to learn the songs, most of which were from Royal Hunt?s Clown in the Mirror and Land of Broken Hearts albums. Only 4 days after their final rehearsal together, DC would find himself in Osaka, Japan standing in front of 2,500 Royal Hunt followers. The shows, which also included performances in Tokyo and Nagoya, were all incredible. He had passed the close scrutiny of Royal Hunt?s loyal and loving Japanese fans; He had been accepted. If the normal pressures of playing in Japan only weeks after joining the band were not enough, the tour also began just 5 days after a tragic earthquake killed thousands of people on and around Kobe and Osaka areas of Japan. As a tribute to those who lost their lives and loved ones, The band wrote and dedicated the song "Far Away". For a few months, this song quickly went to #1 in polls and on numerous charts all over that country; Royal Hunt?s success had helped to establish DC as one of the top singers in the hard rock world. DC recorded two very successful albums with the band ("Moving Target" and "Paradox") before parting ways for personal reasons. In the beginning of 2011 Andre and DC got in touch once more to see if they could cooperate again, which resulted in a small reunion tour. It was a great success and consequently led to the mutual decision of DC rejoining the band. ALLAN SORENSEN - was born on the 24th of April in Copenhagen, Denmark. Kickstarted by his parents at the age of 4, Allan got his first drum-kit as a gift. At first he was influenced by the Danish rock and pop artists, but soon after he would discover the world of metal from bands like; AC/DC, Kiss, Saxon, Dio etc. During his teens, Allan hooked up with Mikkey Dee (Motorhead) in the rehearsal studio. Mikkey became a great teacher and inspiration for Allan's future career. His talents as a drummer were soon discovered by Danish metal band Narita, where he recorded two albums and followed with the project Prime Time. In late 1996, Allan joined Royal Hunt to record the world acclaimed album ?Paradox?, followed by a world tour with the band before becoming a full-time member. After several albums and tours, Allan and the band parted company in the summer of 2000 (but, as usual, in the ?Hunters Tradition? ? continued to stay in touch). Allan then joined Cornerstone, where he recorded four albums and went on tour twice in Europe. In 2004 Allan was invited by Andre to record Royal Hunt?s new album ?Paper Blood?, and due to its success, they decided to again join forces, starting with the recording of a ?Paradox II? to complete the circle. ANDREAS PASSMARK - was born in Linkoping, Sweden on February 17th. His interest in music started early as he began to play cello at the age of 7 and - already after a couple years - turned to his uncle's electric guitar and started to play along with his favourite albums. As his interest in rock music grew stronger, Andreas started his first band with a few school friends where things began to progress a bit more rapidly? local gigs and a few studio sessions followed. When Andreas turned 20 he decided to move to Stockholm in order to expand his musical horizon, and since then has been playing professionally with many different bands in many different styles (from Pop/Soul/Funk to Rock/Metal? bands like Narnia, Rob Rock, Stormwind, Divine Fire and Harmony just to name a few). In 2009 Andreas happened to jam ? on a few occasions at some clubs around town - with Marcus Jidell and (surprise, surprise!) a couple of months later received a phone call from RH's guitarist? next stop: Copenhagen, recording his monstrous 5-string bass for the band's new album and faced his first live show with his new peers at ProgPower USA, and a second one at the biggest rock festival in Japan - Loud Park. JONAS LARSEN - is the latest addition to the ROYAL HUNT family. He rised to the surface of the music world in Denmark by winning the "Copenhagen Guitar Battle" competition two years in a row, 2008 and 2009. Since then he worked as a session musician in various studios and played with the cover band Highway Jam, where he was discovered by Andre. After a few drinks and a jam session with ROYAL HUNT, it was decided Jonas was the missing link. Jonas has been a perfect fit for the band with his virtuoso melodic style and excellent stage presence. So with this current lineup, the fans as well as the critics, are about to get a fresh taste of the powerful and rejuvenated ROYAL HUNT. So far the band has released 10 studio albums, 3 official live albums, 5 EPs. The debut, Land of Broken Hearts, came in 1992, and the newest one, X, in 2010. Royal Hunt's line-up has changed many times during the years. Most notably the band has had four different vocalists: Henrik Brockmann(who later joined Evil Masquerade) on the first two albums, D.C. Cooper (Silent Force etc.) on the next two and John West (Artension) who came in 1999 and has stayed in the band until March, 17th, 2007. 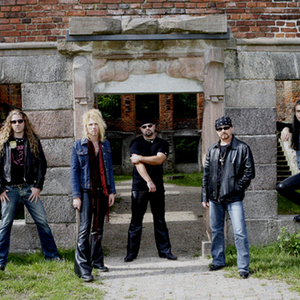 On December, 13th, 2007, the band announced Mark Boals to be the new vocalist for Royal Hunt. During the recent 2008 tour RH had Magnus Ulfstedt on drums, Mats Lev&eacute;n on vocals on 3 shows and Michelle Raitzin on backing and lead vocals.